And for us, here in the PC household, our favorite food during the summer is Ice Cream. Or in my case, gelato. I’m not a huge fan of ice cream – I will eat it, but I have to be in the mood for it and I’m particular about the flavors that I like – unlike Tom that would eat ice cream every single day if I let him. His limit is a pint a month – maybe 2 if he behaves. But, I make an exception with gelato. See what ice cream is to Tom, gelato is to me. For most of us, specific foods trigger memories, and gelato is a trigger for some of the best years in my life – living in Italy. Sun-soaked memories of eating a gelato in the town’s piazza are imprinted on my mind. My favorite is the passeggiata (stroll) in late afternoon, gelato in hand. It’s a ritual that’s hard to duplicate living outside of Italy, and is one that I miss the most. In Italy, enjoying gelato is an art - One eats gelato, not just for the taste, but also to take a moment to relax with good company, family or friends. There are two basic types of gelatos: creamy and fruity. The fruit gelatos do not contain dairy. Gelato must be made fresh and is usually prepared daily in small quantities and served directly to the public. 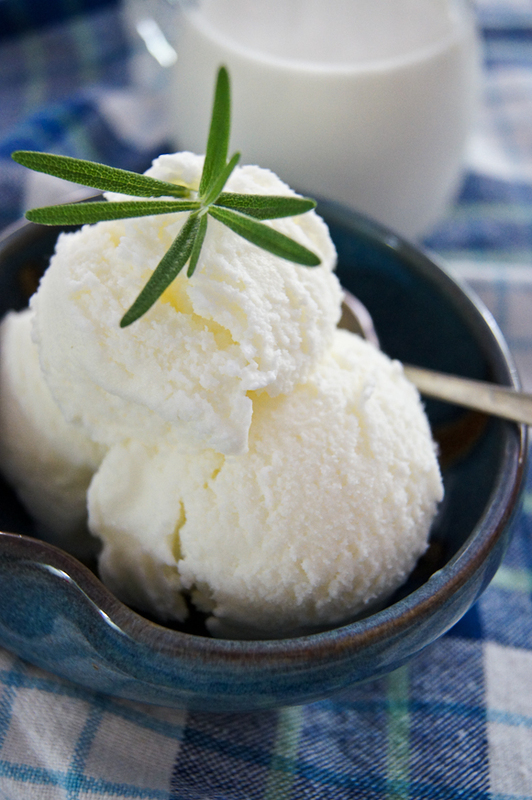 Though creamy, Italian gelato has a lower percentage of fat than standard ice cream because gelato recipes call for more egg yolk and milk, and not as much cream. And the flavors profiles are infinite – truth be known, you can make a gelato out of anything. Walking into a gelateria today, one must arm themselves with patience and savor all those pretty colors and flavor combinations right there for the taking. But, saying that, there is something about the classics. I usually zero in on one particular flavor: fior di latte. Made from just three ingredients (milk, cream and sugar), it’s as wholesome and simple as can be. Eating it reminds me of my mother’s hugs. With all the crazyness that is happening right no in my life, I needed a hug from my mom, and since she was not around, I did the best thing I could and made a batch the other day. Combine all of the ice cream ingredients in a medium saucepan along with the vanilla bean pod and heat gently while stirring until just before mixture begins to simmer. (note: do not let it boil, but just reaches the point where tiny bubbles appear around the edges of the pan), then take the pan off the heat. If you don’t have time, cool mixture over an ice bath, remove the vanilla bean pod, place into an ice cream maker and process according to manufacturer’s instructions. If you do have time, cover and allow to cool to room temperature, then place in the refrigerator for about 30 minutes to really get it nice and cold before placing in your ice cream maker.